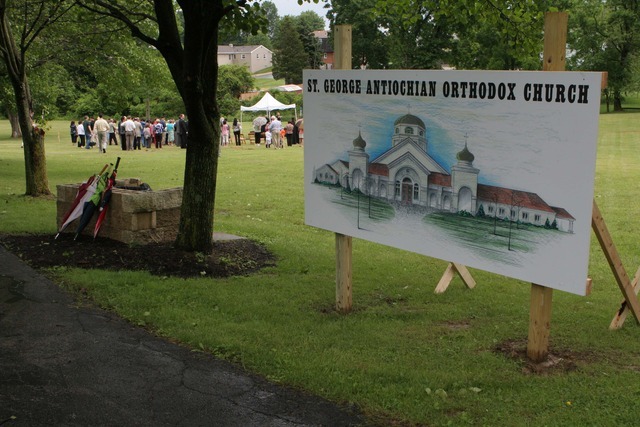 By the Grace of God, and through the commitment of our parishioners and community supporters, St. George Church celebrated the Ground Breaking of a new church building and hall complex. The new St. George will be built on the grounds adjacent to our cemetery property on Washington Pike in South Fayette Township. 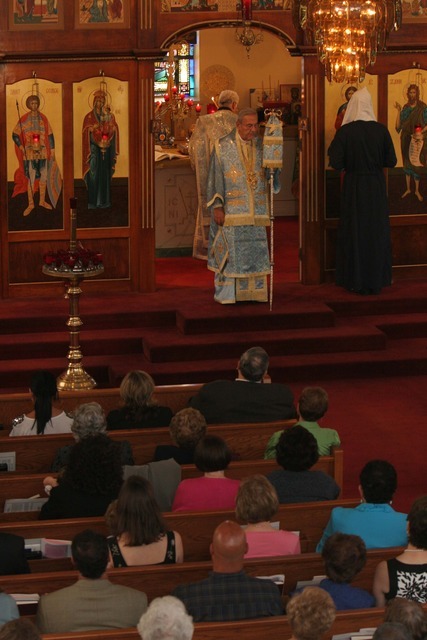 We were honored to have Metropolitan PHILIP of blessed memory and Bishop THOMAS preside over the events of the weekend, which included events for our parish families, friends of St. George past and present, as well as visitors from our community and neighboring parishes. Thank you to all who helped to prepare for and participate in our Ground Breaking Weekend! It was truly a once in a lifetime experience. Visit the Ground Breaking article on www.antiochian.org. Church School Family Fellowship Event: Metropolitan PHILIP of blessed memory and Bishop THOMAS joined the children of the parish and their parents in the church hall to discuss "Christ as the Cornerstone" of our church. 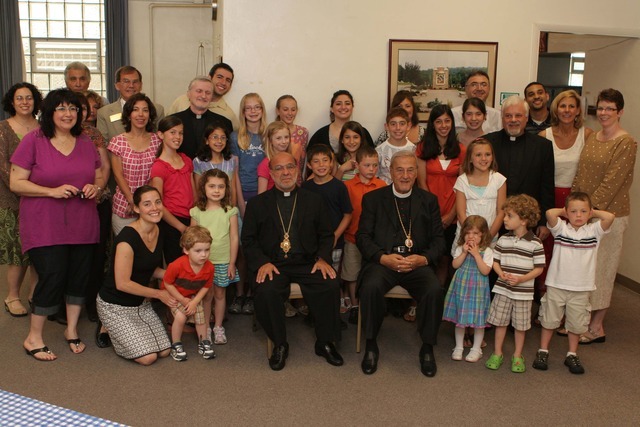 The morning consisted of discussion between His Eminence and the children, as well two group crafts. The children decorated garden stones for use in the prayer garden of the new church and also worked with the Bishops to make a handprint poster that was on display at the Ground Breaking Celebration Banquet. 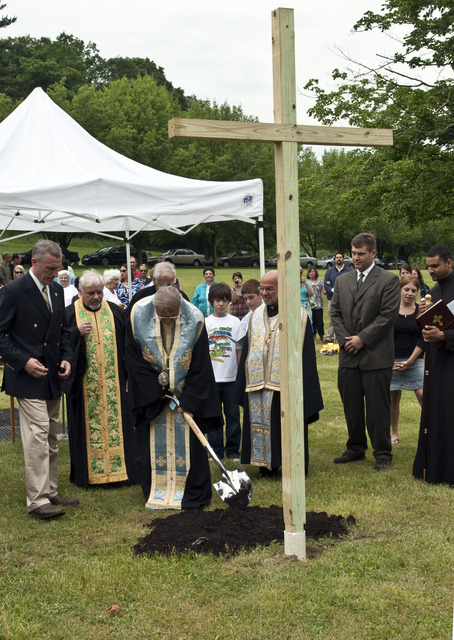 Official Ground Breaking Ceremony: For many, the highlight of the weekend was the Ground Breaking Service that was officiated by Metropolitan PHILIP of blessed memory on Saturday afternoon at the site of the new church. 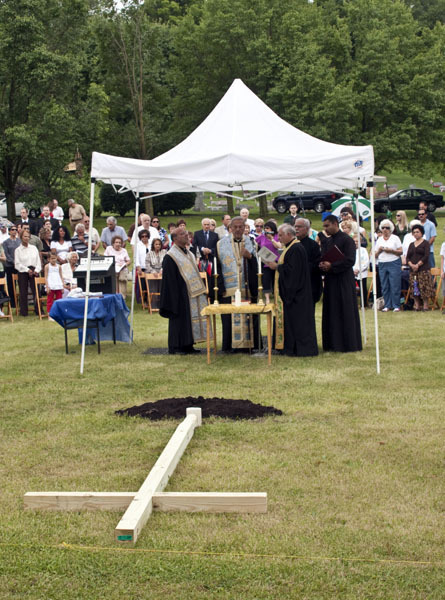 During the service parishioners, friends, family, and community members watched as the ground was blessed, a cross was raised and planted on the location where the new altar will be, and the Bishops turned the first shovels of earth. The Metropolitan then invited many to join him and have their own opportunity to turn the earth including all the Parish Council members, the parish children, and Congressman Tim Murphy, who was in attendance. Attendees were also able to view the new 4' by 8' color rendering of the new church building. 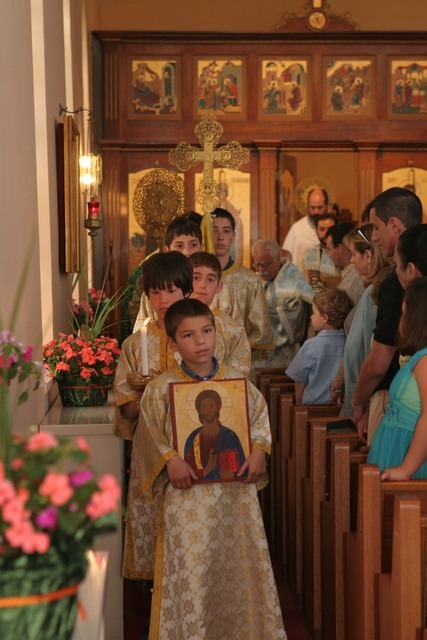 Hierarchical Divine Liturgy: The church was full when His Eminence Metropolitan PHILIP of blessed memory and His Grace Bishop THOMAS celebrated the Hierarchical Divine Liturgy on Sunday morning. Many visiting clergy were present as well as faithful from all around the Pittsburgh area. For many, it was a service they will remember all their lives. 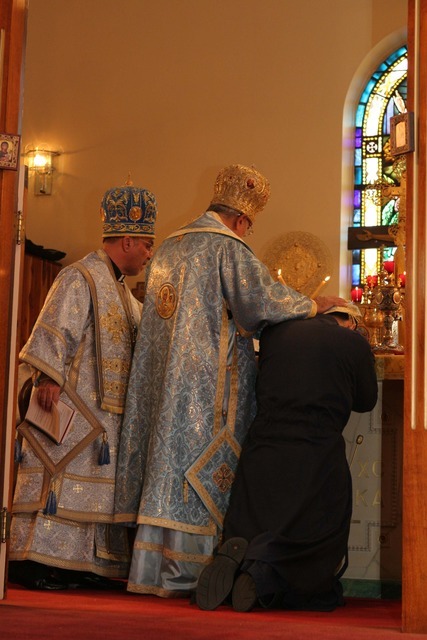 Special Congratulations to Deacon Bogdan Bucur who was ordained to the Holy Diaconate by His Eminence. AXIOS! Ground Breaking Celebration Banquet: The finale of the weekend was a Celebration Banquet held on Sunday evening at the Pittsburgh Airport Marriott. A cocktail hour featuring a splendid silent auction and deluxe basket raffle was followed by dinner and a program of speakers. 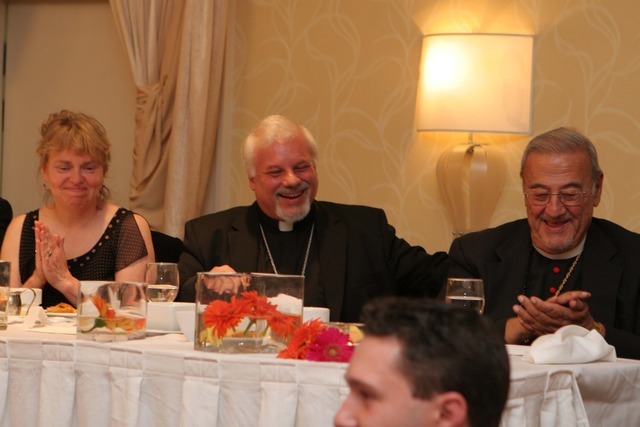 The culmination of the evening was the keynote address by Metropolitan PHILIP of blessed memory. 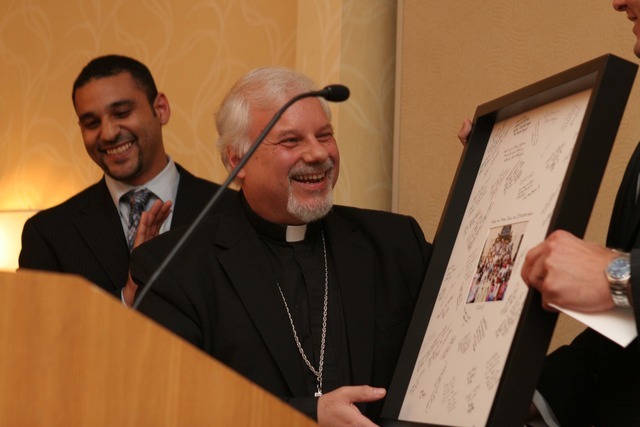 Prior to the end of the evening, special presentations were made to Father Jason DelVitto to celebration his 25th Anniversary of service at St. George of Bridgeville. Additionally, Paul Abernathy was recognized for his recent graduation with honors from St. Tikhon's Seminary. 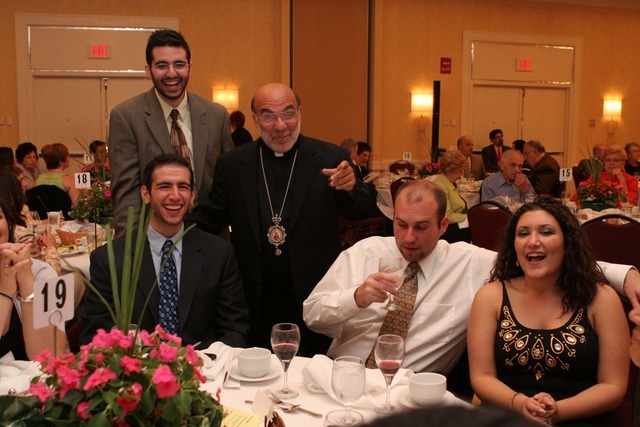 Congratulations to Father Jason DelVitto on his 25th Anniversary with St. George of Bridgeville! 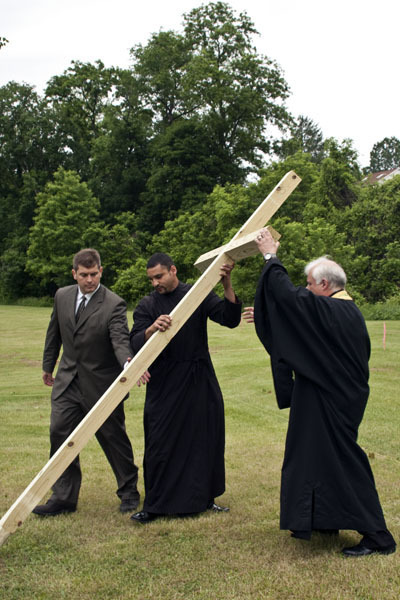 Congratulations to Paul Abernathy on his recent graduation from St. Tikhon's Seminary! All donations to and proceeds from the Ground Breaking Celebration support the St. George Building Project.